A guide to eating food that’s as good for you as it is for the planet. 1. Heat oven to 425 degrees. Line a baking sheet with foil and spray with nonstick spray. Place squash, cut side up, onto foil. Spray with nonstick spray and sprinkle liberally with salt and pepper. Roast for 45 minutes. Remove and let cool. 2. Bring small pot of water (about 1 qt) to boil. Add chicken breasts; reduce heat to a bare simmer and cook ten minutes. Remove and shred or dice. 3. Heat oil in nonstick skillet over medium high heat. Add onion, bell pepper and garlic and saute 5 minutes or until softened. 4. Add salt, pepper, chili, cumin, oregano and brown sugar. Stir and let cook 1 minute. 5. Add beans, chopped chicken, salsa and 1 c. of the cheese. Stir to combine. 6. Heat oven to 325 degrees. 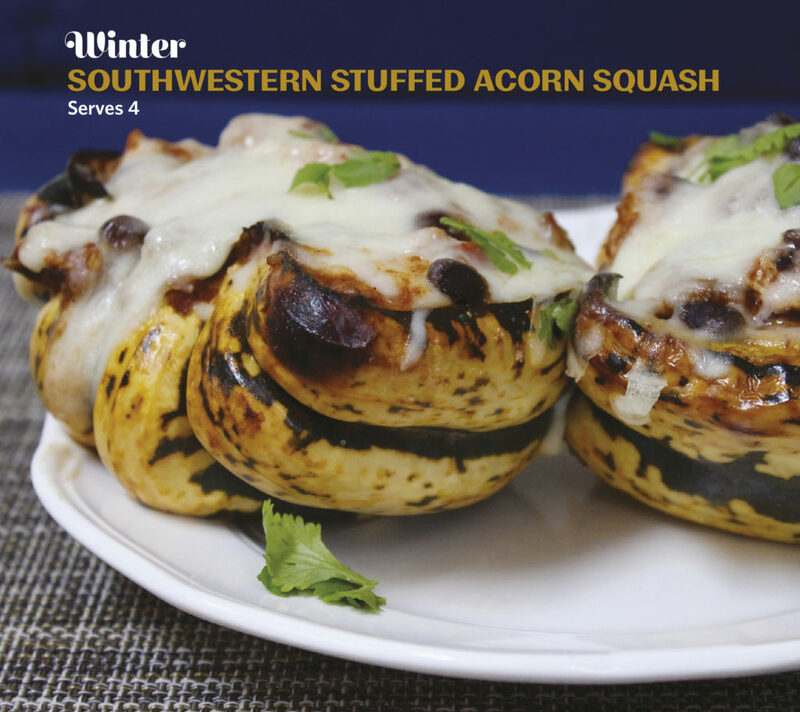 Fill cavities of squash with filling and top with remaining cheese. 7. Bake for about 10 minutes or until cheese is melted and mixture is heated through. Serve, topped with optional cilantro as garnish.